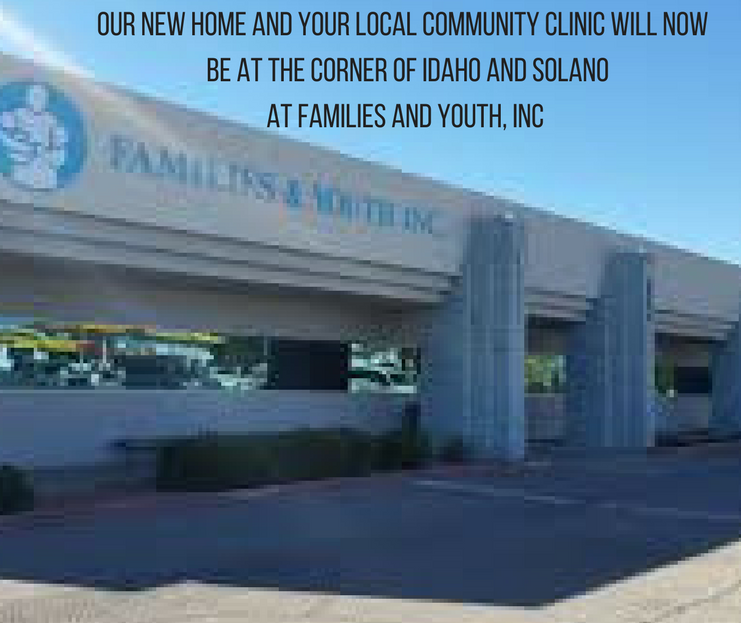 Strolling down South Main street on a Saturday morning in Downtown Cruces, a tent draped and covered with bright and bold Prayer Flags waving in the wind will catch your eye as you pass by our clinic at 130 S. Main. 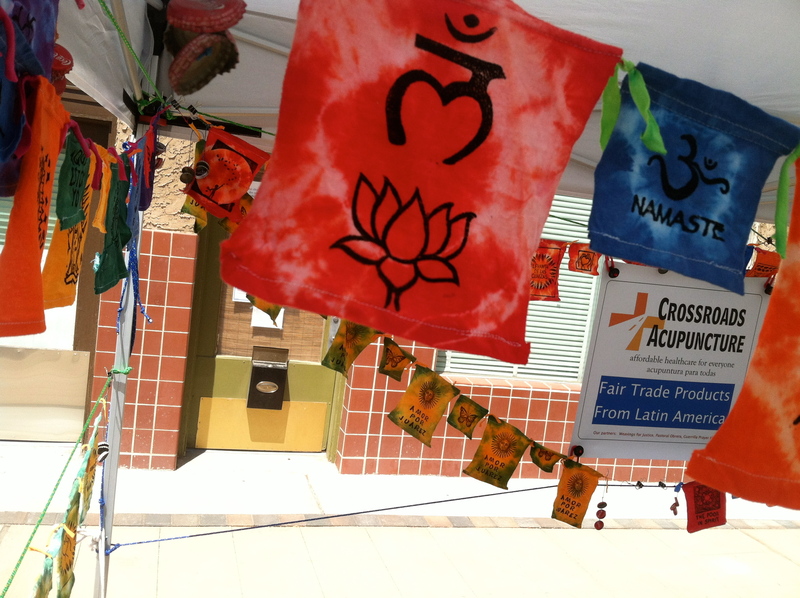 These flags, created by a community-based project in Juarez–Inspired Imports–are our most recent addition to Crossroads Community Acupuncture’s Fair Trade products. Flags are sold at Crossroads Community Acupuncture 130 S. Main for $15 and can be purchased at the Las Cruces Farmer’s Market 8:30-12 every Saturday (just outside our door! ), alongside an assortment of Fair Trade products from Mexico. They are also sold at Mountainview Market 7 days a week! The flags are great as gifts for kids and adults, or can be used to decorate your home, office, or garden. Like all our Fair Trade products, a portion of profits go to benefit the Crossroads Border Project in Mexico. The creation of this new product by Juarez artesans–who call them Guerilla Prayer Flags— come from the tradition of Tibetan prayer flags, which are displayed in many cultures around the world to promote peace, compassion, strength, and wisdom. Guerilla Prayer Flags, made by community workers along the border in Anapra, Mexico, have a variety of different designs. 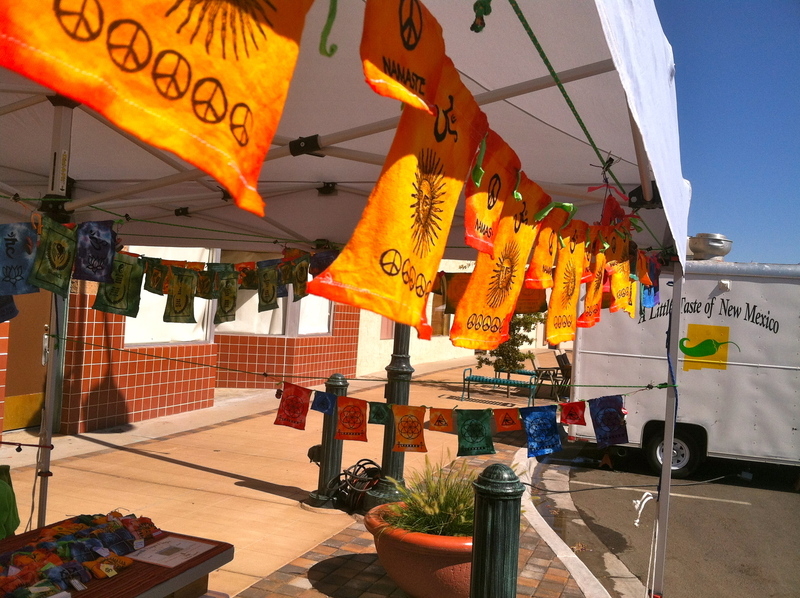 Symbols on the various flags include the Virgin Mary, Namaste, the I Ching symbols, a movement for peace in Juarez, Mexico Amor por Juarez, Crossroads Community Acupuncture’s symbol and many more. Inspirational quotes are found on many of the flag designs, as well. This particular project is run by the La Union-based small business “Inspired Imports,” run by Siba and Rosario Escobedo. They have two lines of Fair Trade items: Rags to Britches & Guerilla Prayer Flags. Both are projects of love and hope that are transforming the lives of 4 Juarez families, and creating some beautiful things along the way. Juarez, MX is one of the world’s bloodiest urban war-zones, right in our own backyard (just an hour away from Las Cruces). The most devastating toll is being taken on innocent families caught in the crossfire. Crossroads thanks Siba and Rosario Escobedo for spearheading this project. They volunteer for Crossroads every week to get the word out about our Fair Trade table. Come meet Siba and Rosario the next time you’re down at the Farmer’s Market!